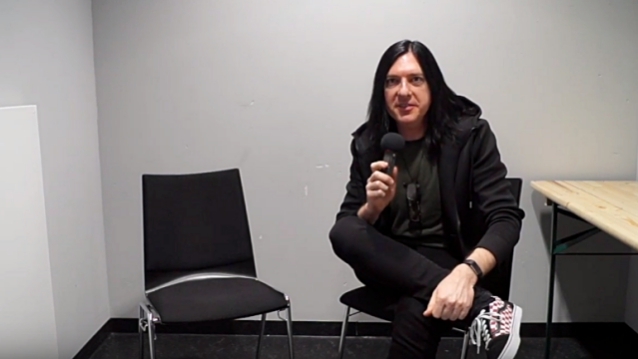 Ornella Carlone of Comebackstage conducted an interview with drummer Brent Fitz of SLASH FEATURING MYLES KENNEDY AND THE CONSPIRATORS prior to the band's March 4 concert at Verti Music Hall in Berlin, Germany. You can watch the entire chat below. A few excerpts follow (transcribed by BLABBERMOUTH.NET). Brent: "We love Europe. We love everywhere over here. It seems like the love of rock music has never waned, but sometimes in the United States, we question if the fans have gone to some other genres a little bit, like country music or pop music. But every time we play over in Europe, we're always pleasantly happy. We have a new record, we play a lot of new songs and people know all the lyrics and they still buy records and that. Especially in this part of the world. So Germany has been awesome. It's been great." Brent: "It's the cliché term, right? It was funny when Slash came up with the title for that. I think it was more of a tongue-and-cheek comment on what was going on. When we made the record in Los Angeles, where we recorded it, we spent a lot of time watching CNN and it might have been poisoning our brains. We were in between recording songs watching CNN going, 'What is going on?' It was kind of like a way of saying 'Living the dream. At least we're living the dream of playing music with all the outside other stuff going on.' You know what? It is a blessing to play music. It's a blessing to be over here in Europe on tour. We've been on tour for two and a half months. It's a pretty good lifestyle, I will say, to get to see the world and play with people I really enjoy working with. I've been playing with Slash and the guys for almost 10 years now. To have a band that everyone gets along and we enjoy the lifestyle is fantastic. That sounds like living the dream." Brent: "Sometimes they choose me. Because I've always wanted to work with people I respected musically or looked up to. Part of growing up where I started, which was in a small city in Canada, the idea for me was to go to those places and where I was from, I grew up playing with my friends in my neighborhood, but I would read in magazines about KISS and MÖTLEY CRÜE and later GUNS 'N ROSES. When I moved to Los Angeles, that opened up some opportunities to play with those people. A lot of times — I don't know if I've made it. But at least I got to work. How did I start working with Slash? He called me. That was the honest truth and it was probably because I worked with Alice Cooper and some other artists. To get a phone call from someone who you respect is quite a cool thing." Brent: "We took a break. The last two, 'Apocalyptic Love' and the 'World On Fire' records were sort of built on some ideas that came together on tour, writing songs during soundcheck, Slash coming up with a cool riff and us getting together and fleshing out some ideas. Both of those records came off a tour and go in the studio, then make the record, then go tour again. Although Myles Kennedy [vocals] still had some ALTER BRIDGE [stuff to do]. He would release a record in between with his band, ALTER BRIDGE. We made all that work. What happened more recently was a little band called GUNS 'N ROSES, where Slash went on tour with them for a very long, extended time, but also with the full intention of coming back eventually to SLASH AND THE CONSPIRATORS and doing new music. We had wrote a bunch of songs on the 'World On Fire' tour that are now the ones on 'Living The Dream'. Slash had put a lot of those ideas together, and then we let them be on the backburner, because Slash was gonna do the GUNS 'N ROSES stuff. But what was cool was we all had that break, and then we came back very naturally and quickly. Slash said, 'I wanna get together with you guys and we'll work on those songs again.' We were all, like, 'That sounds great. Cool. We'll do that.' And we were all doing other bands. I was playing with Brad Whitford from AEROSMITH, and I joined Gene Simmons's band. There was a lot going on in between, but somehow it all came together. So we put a record together with a little break. And it seems like everybody really likes the new record. And I'm not speaking for myself — I love it, 'cause I was really happy with the way it came out. It seems like it's been getting a very unanimous 'thumbs up.' It just came together. Again, a little bit of a break was good for the band." "Living The Dream" was released last September via Slash's own label Snakepit Records, in partnership with Roadrunner Records.